Think about a really good, solid, exterior door latch and lock, the precise snick as levers, springs and bolts slide into place. That’s the Pur Sang Type 35, an assemblage of meticulously cast, precisely machined, artfully formed and carefully fitted parts that communicate exactly what they’re doing, exactly what they’re experiencing, back into the driver’s hands, eyes, ears, feet and backside. Even the most fire-breathing, tire vaporizing modern supercharged road-burner is refined, comfy, cushy and loaded with power assists and computerized driving aids. Computer-designed mounts for anything that rotates, vibrates or reacts to the road isolate the passenger compartment and the driver from vehicle dynamics. Then engineers spend incalculable man-years and unimaginable hours of high-powered computer time refining power steering, power brakes, bushings and suspensions to restore road-feel, adding back the responsiveness lost in user-friendly design and packaging. The isolation becomes apparent when driving the Pur Sang Type 35, a nut-and-bolt reproduction of a 2.3 liter supercharged single overhead camshaft Bugatti Type 35B built in a self-contained enclave in Argentina using artisanal methods and craftsmen akin to those employed in Molsheim by Ettore Bugatti three-quarters of a century ago. The connection between the driver and the Type 35 – and between the Type 35 and the road – is tactile, immediate, intimate. Every control quivers in anticipation of the driver’s input. There is no slack, no play. In March I had the chance to drive Pur Sang’s 8C 2300 Monza at Amelia Island. It was just a few miles and I craved a longer experience. 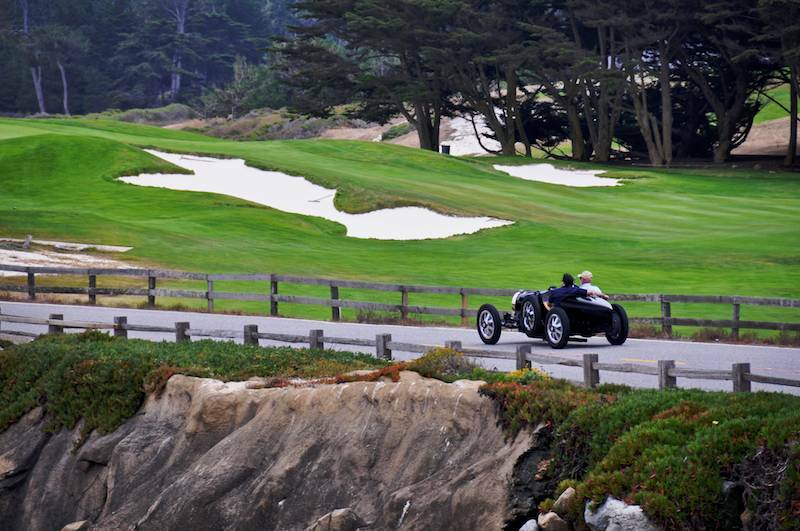 The chance came at Pebble Beach with the Type 35. 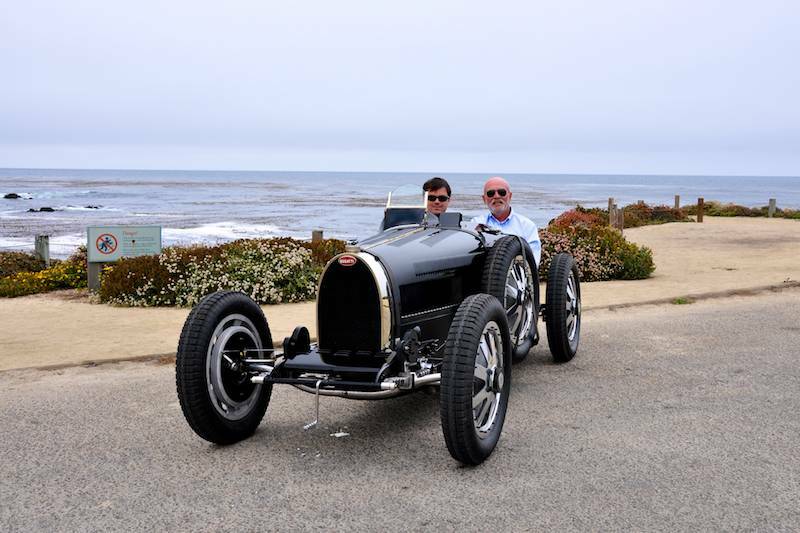 Pur Sang’s Commercial Director for Anglo Markets John Bothwell brought the Type 35 to Monterey on a crisp Tuesday afternoon. Our goal was to drive it from the transporter parking lot at the Pebble Beach Equestrian Center to Laguna Seca where it would rest overnight before joining the procession to Gordon and Molly McCall’s Wednesday Airport Party. John drove down to Cypress Point for some stationary photos, but more importantly to demonstrate the technique of driving an uncompromising old-style car with straight cut gears. Oh, and a shift pattern that’s upside down with first gear back and to the left. Our route to Laguna Seca was indirect, not only to avoid the Monterey crowds but also to experience the Type 35 on roads for which it was intended: narrow, winding and largely free of traffic. Setting off from Cypress Point we negotiated Seventeen Mile Drive past The Lodge. It was an ideal chance to become familiar with the Type 35’s controls, light but also precise and with nearly negligible travel. This is an on-off car. Clutch, gearbox, brakes, even the engine, work through a nearly imperceptible control range that reflects the Type 35’s heritage as a racing car of superb accomplishments. Bugatti favored his own clutch design. It’s small. The pedal has a throw so short from off to on that it’d barely take up the slack in a modern Corvette’s or Mustang’s pedal travel. It’s more like a switch, working precisely with the tiny straight-cut gearbox that nuzzles up to the driver’s and passenger’s legs. Even with the nearly unmuffled eight-cylinder exhaust just behind the occupants’ heads the sound of gears – in the transmission and in the gear trains to the single overhead camshaft and supercharger – is the Type 35’s dominant note. The gearbox is the aforementioned crisp, solid, accurate analog of a quality door latch. It’s in, or it’s out. There’s no in-between. When it works, it’s as satisfying as a perfectly drawn draft beer. 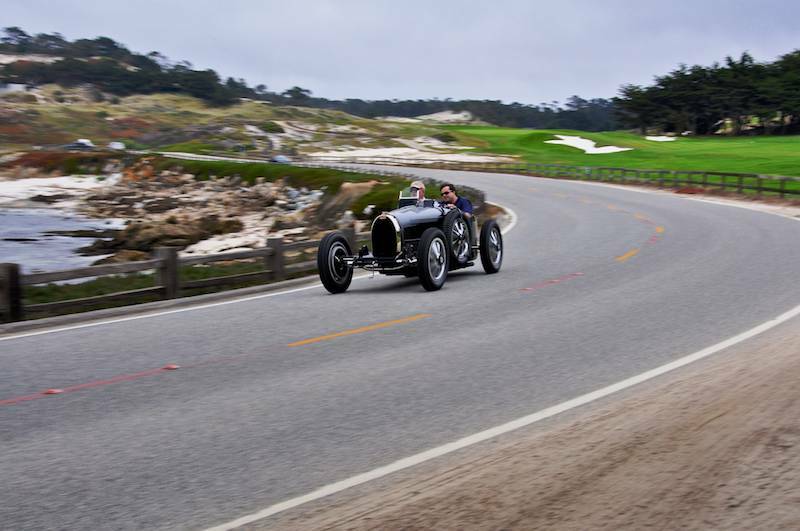 Heading up the hill to the Route One Gate the nightmare became real: one of the Pebble Beach Tour d’Elegance cars had emitted its coolant at the top of the hill, slowing traffic to a crawl past it. Fortunately the Pur Sang Type 35 has an electric radiator fan, and it was a cool day in the Del Monte Forest, keeping the driver cool, too. The technique is simple. Sit, in neutral with the clutch engaged. Wait for a gap to open up, then close up to the car ahead and repeat the process. The queue behind us were blessedly understanding and soon caught on to the sequence. The experience deserves a sidebar on Monterey week. Residents who don’t understand “Monterey” decamp for somewhere not populated by strange old cars and their drivers. Those who remain, understand. Visitors cherish the experiences, like seeing a parade of Mercers rumble by or following a cranky Type 35 up the Seventeen Mile Drive hill. Once past the gate instead of taking the 270 degree loop onto northbound 1 we cut left onto Aguajito Road, a blissfully empty road that dips and winds through the Del Monte hills. 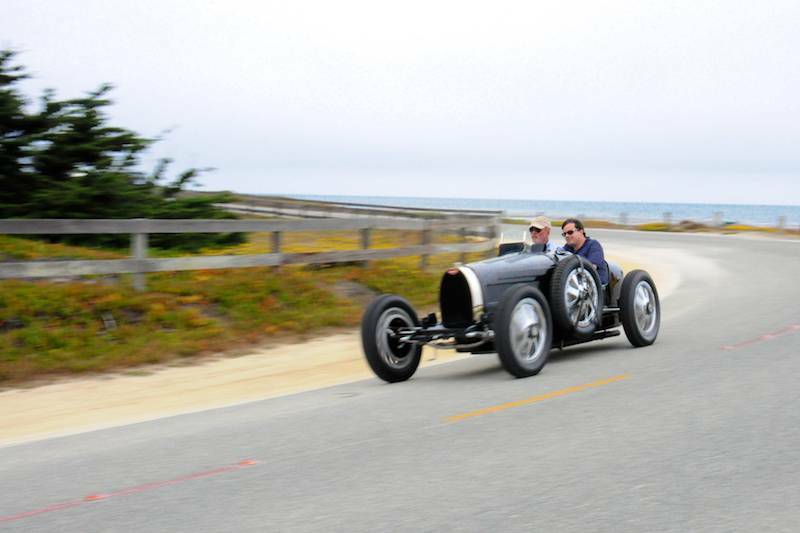 It’s not the Targa Florio, but on Monterey week it’s as close as it gets. Here the Type 35 shows its stuff: precise steering, wheels proudly out and in view, brakes that used judiciously with quick double-clutching downshifts for engine braking make it abundantly clear why Ettore Bugatti’s cars – and the concept that guided their evolution – were so successful for so long. Not to mention why they are still so highly regarded decades later. Lesson learned. The Type 35 loves to rev and runs happily in a range far higher than the Challenger SRT that brought us to Laguna Seca. It’s not a hard car to drive. The engine has power throughout its range. The brakes work smoothly and efficiently. Its eight tiny cylinders sound glorious. After dipping through hills and canyons Aguajito Road runs back into Route One just before the Route 68 turnoff and the traffic to Laguna Seca and Salinas. We avoided a few traffic lights (thank you, CHP, for being absent), then negotiated another jam using the Seventeen Mile Drive technique before turning into the track. There’s a lovely, winding hill up to the track off 68. Traffic was down in the valley. The Type 35 earned many laurels on hills like La Turbie above Monaco and Shelsley Walsh in Britain. The approach road to Laguna Seca showed the Type 35 at its best. Pur Sang’s engine is nearly 50% more powerful than Bugatti’s Type 35. Dyno tested before delivery, they deliver 170-180 brake horsepower. The Type 35 weighs something like 1500 pounds wet. Even carrying a hefty driver and passenger it’s still under a ton and a weight/power ratio of around 11 pounds/horsepower. By the time we reached the turnoff to Laguna Seca the funky upside down shift pattern, short clutch throw and no-nonsense steering were becoming familiar and it just flew up the hill, an exhilarating culmination to an afternoon’s experience that was way too short. It isn’t a Bugatti. There’s an alternator hidden under the floorboards driven off the driveshaft and the aforementioned electric fan. The engine runs plain bearings for simplicity and long life – although purists can have Pur Sang assemble a built-up roller/ball bearing crank like Ettore preferred. Argentina’s closed economy makes it impossible to import components. In the world economy that’s silly, but for the Type 35, its Bugatti-based counterparts and the lovely Alfas like the 8C 2300 experienced in Amelia Island it means that everything, right down to the frame rails and tires, are made holistically in Pur Sang’s self-contained atelier or to its specs from Argentine suppliers. It’s a window back into a time when automobiles were built by artisans, not automatons. The cost of re-creating history is not cheap, but it is, roughly, 1/10th the cost of a Molsheim-built Bugatti or a Milano-built Alfa 8C. And, if the cornering power of the Pur Sang Type 35’s straight axles and narrow tires is misjudged and the fabulous hollow forged front axle is bent against a barrier, it doesn’t have to be fastidiously reconstructed to retain its original Molsheim markings. It’s just a car. Purely, simply, emphatically mechanical, there’s no interruption between the Type 35’s driver, engine, clutch, gearbox, brakes, suspension and tires. It’s direct, immediate, tactile and fantastically full of feedback. The Pur Sang Type 35 is the antithesis of the modern automobile. And that is good. For more information contact Pur Sang’s Commercial Director for Anglo Markets, John Bothwell, at john@pursang.us or (949) 698-6603. You won’t be disappointed. Boy, what an experience that must have been. You really put us in the driver’s seat and what an impressive place! Keep watching. We have a few more drives like this coming up, including one of my absolute top-of-the-list dream cars from the 1960’s. Being lucky enough to have regular access to a T51 from Pur Sang, (a twin cam version of the 35b) I can agree that it is a totally involving experience to drive and virtually identical to the ‘real thing’ . Most Bugati experts would find it almost impossible to tell from a real one. Indeed a number of original racing Bugatti’s in the UK actually run Pur Sang engines and gearboxes!!!! A few things are not so good particularly the lack of a magneto (a bit nitpicky) and the tyres which Pur Sang make themselves. These are truly horrible. Other than that the car is a reproduction ‘tour de force’. It’s still a fake ! Yes, it is, although you’ll notice that nowhere in the drive report is it described as a ‘Bugatti’, always as a Pur Sang Type 35, so in that sense it is exactly what it claims to be. The important matter is that it accurately re-creates the look, feel and sensation of driving the real thing at a cost about 1/10th that of a Molsheim Bugatti. We could extend this discussion nearly endlessly, which I’d be delighted to do some time when we’re in the same locus. You bring the single malt, I’ll bring the ice. That depends on the owner. Some years ago I was at Lime Rock and someone brought a rather dingy type 35 to use out on the track. I was amazed at the speed and road holding capabilities of the car! Thanks for your observation on the tires. I’d wondered about that. To be honest, it is my belief that Pur Sang’s tire manufacturing is not a matter of choice but rather the result of the Peronist, protectionist economic policies of the Kirchner government. It makes it virtually impossible for Pur Sang to import anything, even simple things like spark plugs, belts, fasteners and tires. Necessity is the mother of invention but the cost of a set of good historic-style tires should be part of a Pur Sang buyer’s checklist. I agree Rick. Just as you accurately describe, Right down to the road everything about this car looks and clearly feels and goes like hell as the original 1925 Type 35a I regularly rally in. Naysayers have’nt a clue. Our car is not a museum piece nor a dilitent’s toy, it’s a living, breathing workhorse of joy. Just curious – how would something like this get registered in California? It looked like there was a license plate attached to the right rear flank, but it didn’t look Californian. I’d bet money this beauty wouldn’t pass smog or any other regulations here, so how does one drive it on the roads? Great review! What a magnificent car. 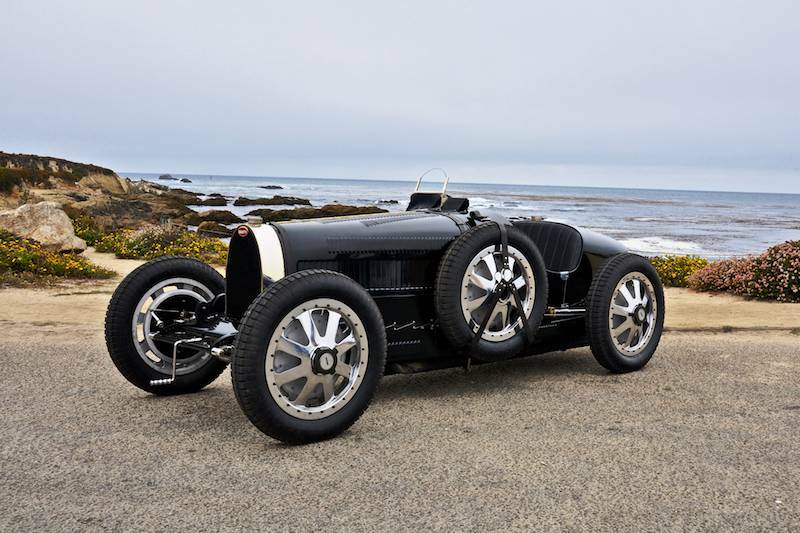 This car would get registered as a reproduction with either a chassis, frame or drive train composed of parts equivalent to a pre-1976 manufacture. Think of all of the fiberglass hot rod Model A Fords toting 350/350 Chevy drive trains that are rolling around California… Not a darn one of them is original anything. California is actually one of the best states to register reproduction classics. Type 35s look like they are really screaming when they wind their way up Prescott. What other car had as long a racing career? I’d love one of these “fakes”. Corbett is a troll.